Port Wine Stains are birthmarks that usually appear as red or white marks on the face. They are due to abnormal vasculature under the skin. Here is all that you need to know about port wine stains and their removal. Children are normally self-conscious of how they look and appear among their peer, especially in their tentative teen years. When a child has a permanent birthmark such as a port wine stains that is persistent and eternal, it can greatly affect the kid’s confidence. Port wine stains are a vascular birthmark that is caused by the unusual development of blood vessels within the skin. It is a flatly shaped mark on the skin with a purple or red pigmentation that appears on the face, head, legs upper tank, arms and the neck. The birthmark is described as a hemangioma type ailment due to the abnormality of the capillaries that result in a skin disorder. It birthmark is usually present at birth. Port wine stain is also referred to as capillary malformation, nevus flammeus or fire mark. 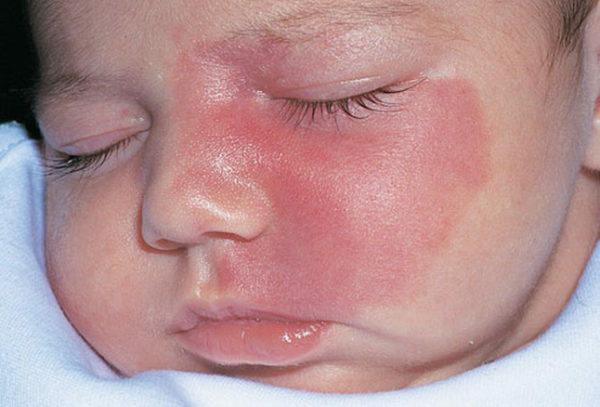 Unlike other birthmarks such as stock bites which fade away within two- three years of appearance, port wine stains are persistent throughout the life span of the affected individuals. Normally the affected skin area that carries the port wine stain matures in proportion to an individual personal development. Normally port wine stains are caused by the irregular growth of blood vessels in the skin. 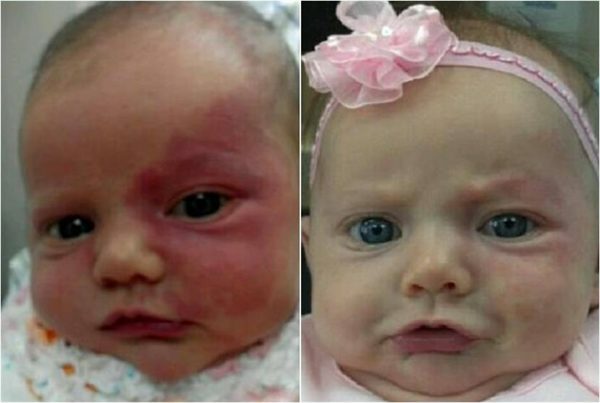 The precise cause of port wine stain development in newborns is not definite however health experts believe that the changes in the blood vessels are normally caused by mutation of the genes. This sentiment is echoed by a published research of the May article of New England journal of medicine, the journal concludes that port wine stains occur due a single random change to the gene after conception. The changes in the gene usually occur during the early stages of the pregnancy period while the infant is growing in the mother’s womb. This mutation gene change in blood vessels is not inherited and health experts dispute claims that the formation of port wine stains is any way interrelated to issues happening during pregnancy period. With extensive research done port wine stains on the upper part of the face has been associated with certain conditions which are a cause for alarm especially among children. These conditions include. Though the condition is rare, a port wine stain mark on the child skin, especially around the scalp, eye or forehead, is associated with a condition widely referred to as Sturge-Weber syndrome. In addition to affecting the skin, port wine stains affect the brain’s blood vessels which often causes patients with the Sturge-Weber syndrome to have seizures. Port wine stains are a persistent skin birthmark that matures proportionally in size as the children mature with age, often when the child has birthmark around the eye, there is an increased risk of developing glaucoma. Doctors believe glaucoma increases pressure within the eye which often leads to blindness if the condition is not treated at an early stage. Early diagnosis of glaucoma is treatable and the patient’s eyes are administered with eyes drops or an eye operation. Parents with children who have port wine stain can easily compare between the normal eye and the eye on the port wine side. 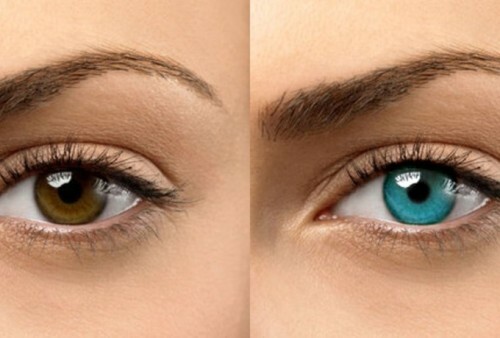 Usually, the pupil on the port wine side is bigger, the eyelids are more open, and the eye itself is normally larger compared to the other eye. If these symptoms are more prominent on the child, it is advice able to check with the ophthalmologist to further examination. Having a large port wine stain on the leg or arm is often associated with having a surplus growth of that limb. This condition is widely known as Klippel Trenaunay syndrome. Port wine stains slowly change in texture as at first the marks appear smooth and red and with time it changes to become thicker, purplish and pebble. The therapeutic procedure converts light energy to heat energy which in turn is absorbed by the red color within the blood vessels. The laser light allows selective treatment of the tissue that contains the infected blood vessels. The laser beam treatment is significant in the sense that it treats small proportions of the affected skin. Doctors recommend roughly 4- 5 treatment sessions a year for significant results depending on the birthmark characteristics. Additionally, if the port wine stains are stubborn and persistent and no significant results are visible after laser treatment doctors recommend the use of laser treatment with a Pulsed dye laser. This kind of treatment uses a yellow light beam and dye. The dye is mixed with a solvent to make it soluble which in turn is immersed by the vessels. The absorption allows the blood vessels to shut so that they don’t vasodilate. Carry out a patch test on the child before administering laser treatment. 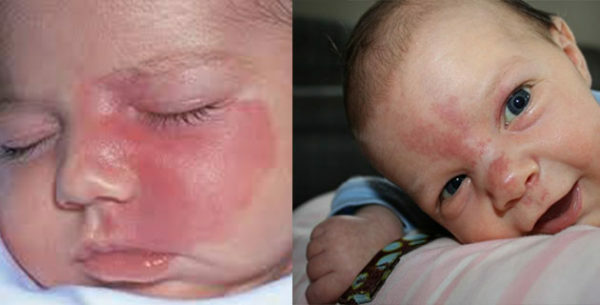 It will determine whether the port wine stains on the child’s skin will respond positively to the treatment. During regular laser treatment, the children are administered with a general anesthetic. This may have significant side effects on the infant neurodevelopment. Therefore, it is advised that children below the age of two should not be given general anesthetics. The skin will look sore and bruised after each laser treatment. Therefore, it is imperative that the child skin is taken take off as it is sensitive. This therapeutic procedure does not remove port wine stain. All it does it acts as a cover up by applying a special makeup type that is water resistant. Remember to remove makeup with a cleansing cream each night. 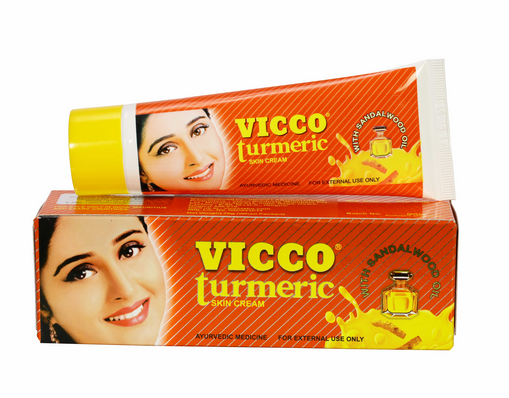 If applied on other areas of the skin, then it is best left on the skin for three to four days. The condition is rare but at times the underlying tissue underneath the port wine stain may enlarge. 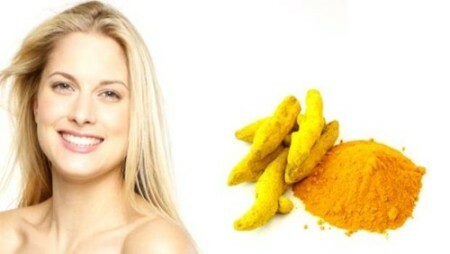 This condition is most common around the lips. This develops whenever the port wine stains develop small blood vessels blisters that frequently bleed out. Early diagnosis allows proper treatment for the condition before it worsens. At times the port wine stains can become very dry, itchy, hurtful and infectious especially if it bleeds. Dermatologist recommends the use of a moisturizer to nourish the skin and make it hydrated. In the case of a bleeding port wine stain always ensure that the wound is cleaned with soap and water. 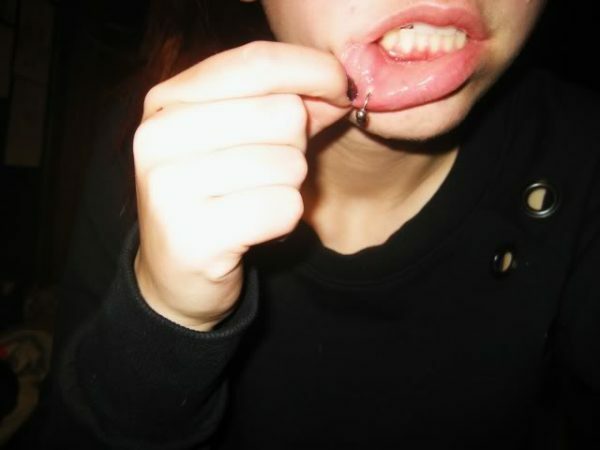 Use a bandage to firmly place pressure on the affected area until bleeding stops. After treatment with laser surgery ensure that don’t not rub or scratch the affected area. Use lukewarm water to gently cleanse and apply the prescribe oil for faster healing and infection prevention. Due to the sensitivity of the birthmark, it is important to counsel children. This should be done at an early stage so as to build their self-confidence. Having a birthmark scar can cause a long stir among the public. It may be hurtful to children to have to be asked certain questions and they lack a well-reserved answer. Parents ought to explain to children that it is just a mark. Children are also sensitive to their parent’s views, remarks, and opinions. At all times parents should show confidence in relation to how to handle, care and treat port wine stains. Emedicine.medscape.com. (2017). Capillary Malformation: Background, Pathophysiology, Epidemiology. [online] Available at: http://emedicine.medscape.com/article/1084479-overview [Accessed 12 Jul. 2017]. Gosh.nhs.uk. (2017). Port wine stains. [online] Available at: http://www.gosh.nhs.uk/medical-information/port-wine-stains [Accessed 12 Jul. 2017]. Birthmark.org. (2017). The Vascular Birthmarks Foundation. [online] Available at: https://birthmark.org/node/23 [Accessed 12 Jul. 2017].